Former U.S. Vice President Joe Biden delivers remarks during the National Minority Quality Forum on April 9 in Washington, D.C.
Joe Biden is expected to join the presidential race any day now, and it’s hard to recall another campaign with two such distinct paths: He could ride his well-known name and moderate’s appeal to victory, or his old-school approach could fail in a humiliating fashion for the former vice president. So far, Biden has not made deep inroads in the early nominating states of Iowa or New Hampshire. But it’s clear that Biden-world is preparing for launch. The first job offers for New Hampshire staff are expected to come within the next few days, and high-profile endorsements are being lined up, according to a Democrat helping Biden prepare his presidential bid. Biden’s decision is the last major missing piece of the 2020 puzzle for Democrats. Let’s break down the arguments for how Biden’s presidential run could turn out. There are a lot of factors in his favor. Biden is, by far, the front-runner in an increasingly national media landscape (think CNN’s town hall series) and countrywide map. In contrast to past primaries, candidates are spending more time in states that appear later in the nominating calendar, such as Texas and Georgia, as they hunt for voters and donors. This nationalized primary race was, in a way, invented by Donald Trump. Not only did he avoid back-slapping local power brokers in the early states, but he also spent more time talking about his campaign on CNN than he ever did in Concord, N.H. If Biden is playing well nationally, and that drives what happens in the early states, will it really matter what kind of on-the-ground campaign he has in Iowa or New Hampshire? Except Biden is also leading in polls in Iowa, New Hampshire, Nevada, South Carolina, and California. That’s right, all of them. This may be because Biden has his party’s moderate bloc all to himself. As rivals stake out positions appealing to a vocal left, Biden might be the only home for voters who are less comfortable with, say, Medicare for All or the Green New Deal. Who would be Biden’s chief competition as a moderate? Without former New York City mayor Michael Bloomberg in the race, it may just be Senator Amy Klobuchar of Minnesota, who says she wants to run as a moderate Midwesterner. But compared to Biden, she is basically unknown. Lastly, there are less tangible yet important factors voters say they want — authenticity and electability. Biden scores well in these categories. Over decades he’s cultivated an image of “Uncle Joe” — a guy who might say and do cringeworthy things but is, above all, his authentic self. But Biden’s best argument might be that he is the most electable, at a time when Democrats are telling pollsters being someone who can beat Trump is the most important quality in a nominee. He is known, battle tested, and grew up in Pennsylvania, one of the three “blue wall” states Democrats need to flip back from Trump — in addition to Michigan and Wisconsin — in order to win the White House. Indeed, Biden was seen last week being filmed by his childhhod home in Scranton, Pa. — presumably working on his announcement video. After all, his last two runs ended in defeat: His 1988 campaign finished with a plagiarism scandal, and his 2008 bid was filled with gaffes (although he impressed Democrats enough that he got the No. 2 spot on the ticket with Barack Obama). In both of those presidential runs, Biden did not even make it far enough to be a candidate in the New Hampshire primary. Fund-raising was always an issue for Biden, who never kept pace with rivals, in part because he was a senator from Delaware, a small state, and never built a national network of donors. 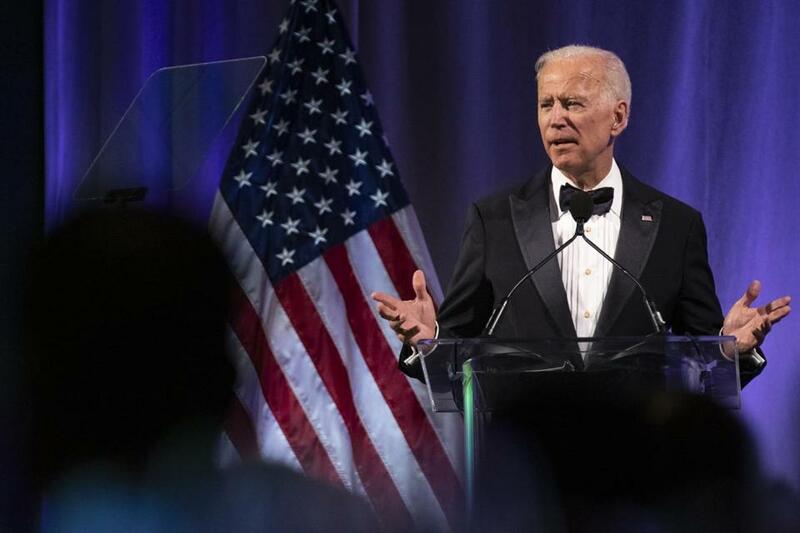 Now consider what Biden, 76, faces in 2020 in terms of the money race: Instead of seeking big checks from bundlers, candidates today raise money through small-dollar donors who contribute monthly. Biden has never had to create such a list, though his high name recognition and decades of relationships could help him get moving quickly. But Biden’s politics is where it could get really ugly. For the most part, Democrats are telling pollsters they aren’t all that bothered by Biden’s touchiness in the past. But on substance, he has some potential troubles: Biden will be the only one in the largely liberal field of candidates who has voted either for NAFTA or the 2003 Iraq war authorization. He voted for both as a senator. He was also seen as favoring Wall Street in a bankruptcy bill while in the Senate. This week brought another storm cloud. CNN found letters from the late 1970s in which Biden, in his own handwriting, opposed busing to desegregate schools, hoping to endear himself to a powerful Mississippi Democrat who believed African-Americans were an inferior race. The letters surfaced at a time when some Democrats are discussing reparations to African-Americans for slavery. Then there’s the lack of a ground game for Biden. For someone who has been in politics for decades, he has remarkably little supporter infrastructure in Iowa, New Hampshire, or South Carolina. Biden will need local supporters to quickly organize to build an e-mail list, stage events, and serve as validation that he is a major contender with real support deserving of his front-runner status in polls. Today, in New Hampshire, the number of people who regularly talk to Biden can be counted on one hand — though one of them, Steve Shurtleff, was just elevated to be the New Hampshire House speaker. Meanwhile, Biden’s rivals have been working the grass roots for months and, in some cases, years. Senator Bernie Sanders has actively maintained contact with his New Hampshire steering committee since his last run, and Senator Elizabeth Warren started calling up activists and office holders last year in preparation for her bid.